If I had to pick a top favorite prince...it would probably be the Beast/Prince Adam. 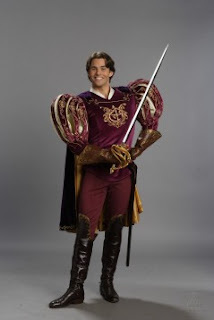 But since I continually choose Beauty and the Beast favorites, I'm going with another favorite: Prince Edward from Enchanted. This guy is hilarious. He's first introduced, in animated form, while fighting off a giant. He ends up in New York City in search of his lost princess, Giselle - and he's just hilariously out of place. Everything he says and does makes me laugh, which is why I'm giving him the win today. And he's played by James Marsden, which gives him extra bonus points of awesomeness.